Last Chance to Win a Free Trip to LAC 2019? Time is running out to throw your hat in the ring for the LAC 2019 Sweepstakes. This year, instead of submitting a photo, SNA is asking you to use your phone camera (or a regular camcorder if you’re more comfortable) to record a 30- to 60-second video demonstrating how school meals make a positive difference in your community, school or district. Another twist this year, SNA members will cast votes for the finalists on SchoolNutrition.org, meaning you decide the winner! 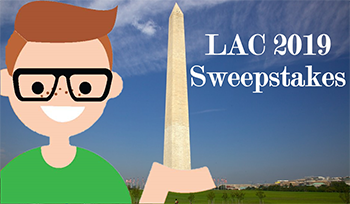 That winner (you or a lucky friend who love school meals) would receive a free trip for two to the 2019 Legislative Action Conference (LAC) held in Washington, D.C. from February 23-26, 2019. To enter, email your video to either advocacy@schoolnutrition.org OR fill out the online entry form. All video submissions are due by next Wednesday, November 14. For all the details, contest rules and more, visit the official LAC Sweepstakes page.